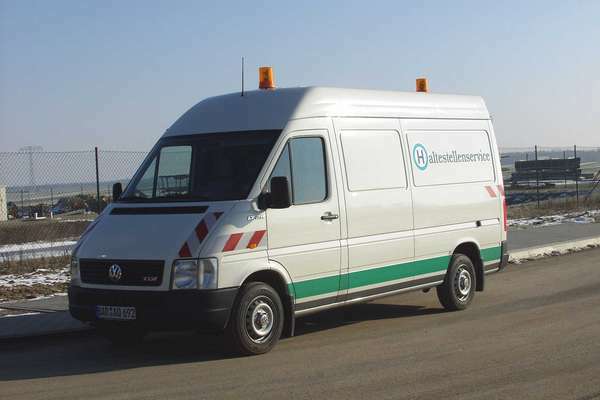 The service car for bus stops of the German type Volkswagen VW LT 28 was a closed van. This was a 2 axle, rear-wheel drive vehicle. The vehicle had three seats. On both sides of the van was written the same text: Haltestellenservice (Service for bus stops). It was equipped with 2 yellow warning lights and many different work tools. The vehicle was 5585 mm long, 1933 mm wide and 2820 mm high. The vehicle was equipped with a four cylinder four stroke Diesel engine with 70 kW performance by 3500 rpm. The Diesel engine had a cubic capacity of 2641 ccm. The maximum speed was 136 km/h. The unloaded weight was 1920 kg and the admissible total weight 2800 kg. The vehicle may be equipped with tires of the size 195/70R15 104/102R. The vehicle could pull a trailer with a weight of 750 kg (without trailer brake) or a trailer with a weight of 2000 kg (with trailer brake). The maximum noise level (no driving) was 78 dB and the maximum noise level (driving) is 74 dB. The service car for bus stops had have the registration number BAR-AQ 692. The vehicle got the first license on 19 December 2002. 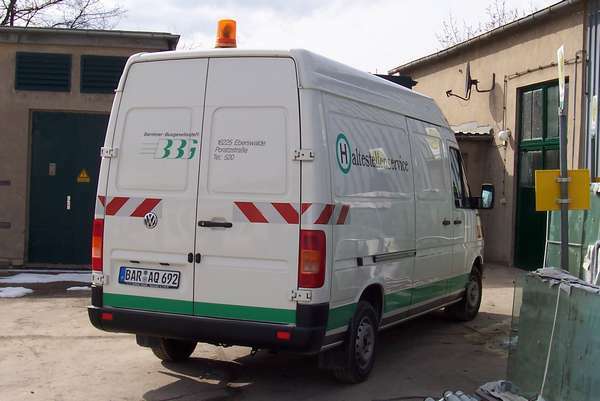 The photos show the service car for bus stops in the Barnim district and at the depot Eberswalde/Nordend.